It used to be that if you wanted to send an NFL player to Siberia, you shipped him to Green Bay. Now it’s a much shorter trip. You move him to guard for the Seattle Seahawks. Read my latest article, published in Oregon Sports News, The Hit Job,the Seattle PI and KGW.com. Preseason games are hard to get excited about, I’ll grant you that. There are three things, however, that will be of interest in Friday night’s contest between the Seahawks and the Denver Broncos. Read my latest article, published in Oregon Sports News. KGW.com, GoLocalPDX and the Seattle PI. Quarterback Russell Wilson thinks the Seattle Seahawks’ receivers are the “best looking” position so far on the 2014 team roster. Wilson said “Our receivers right now are as fast as it gets. You’ve got Percy Harvin, Doug Baldwin — Jermaine Kearse is extremely fast too. 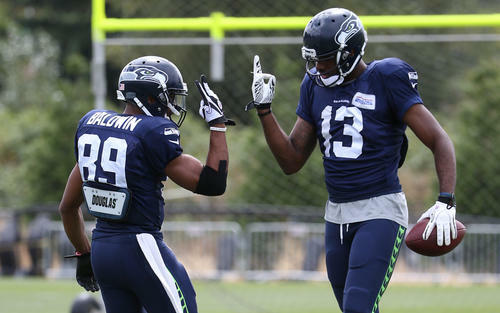 Then you add Paul Richardson.…” Yup, Wilson sounds pretty pleased, indeed, with his pals’ pass-catching prowess. Should he be? Well, of course. It’s June. Read about it on Oregon Sports News. The Seattle Seahawks of recent vintage, who rely so heavily on Marshawn Lynch for their offensive identity, will go through an identity shift beginning in 2014. Read about it on Oregon Sports News or in The Oregonian. Rookies? Who needs rookies? Every team does, in fact. However, you don’t necessarily want them starting for you on day one of week one of the first season in defense of your NFL championship. The Green Bay Packers will open the 2014 NFL season by visiting the reigning Super Bowl champion Seattle Seahawks on September 4. The Packers figure to start a couple of rookies in this matchup while the Seahawks likely will only have rookies in support roles. Advantage: Seahawks. It’s one of several edges they have in this game. See my way, way, way too early preview of the game in Oregon Sports News. … all add up to? If you’re 24-year-old Earl Thomas, Seattle’s heat-seeking missile of a safety, those numbers add up to $40 million — as in dollars — as in new money on top of the $4.625 million Thomas is due to make in the 2014 season. All total, Thomas’ contract with the Seahawks now averages a league-leading $8.925 million-per-year, with $27.725 million guaranteed. Read about Earl Thomas’ new contract and how it impacts The Seahawks’ salary cap on Oregon Sports News. The Seattle Seahawks recently made a couple of intriguing moves, adding to their offseason roster depth. Welcome back, Sidney Rice and welcome to the team, former Oakland Raider Terrelle Pryor. Read how the arrival of Rice and Pryor — the only “name” veterans Seattle has acquired (or re-acquired) in the offseason — will impact the roster as we head toward the 2014 NFL Draft.